The first long distance footpath with a route designed to promote geology has won the coveted ENI Geological Challenge Award. 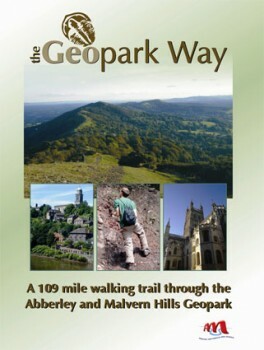 The Geopark Way is a 109 mile way-marked route traversing the hills of the Abberley and Malvern Hills Geopark from Bridgnorth in Shropshire, through Worcestershire and Herefordshire to the city of Gloucester. Passing through beautiful countryside and distinctive villages and towns, it also allows the walker to explore 700 million years of Earth history along the way. The route is described in a 136-page full colour booklet, which splits the walk into 17 day-long sections, gives interpretation of the geology and landscape, and includes a listing of other nearby tourist attractions and amenities. It is this guide, published by Herefordshire and Worcestershire Earth Heritage Trust, which has been recognised for its excellence of content and innovation in bringing geology and landscape to life for the geotourist. Read more about the trail guide and order a copy from the Herefordshire and Worcestershire Earth Heritage Trust website or call the Trust on 01905 855184. The Geopark Way trail guide is also available from Tourist Information Centres, bookshops, museums, tourist attractions and businesses along the route of the trail. It is listed by Book Data and may be ordered through any high street bookseller. Price £9.95 for the trail guide booklet, or £15 with a geological map of the route.